Casino bonus and deposit carry a 30X play through requirement and expire in 15 days. 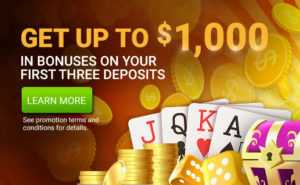 CanPlayCasino.com players who deposit up with deposit code QUAD10 on Sunday, November 4th will receive a 10% Match Deposit Bonus up to a $100 Bonus. 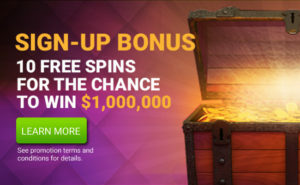 CanPlayCasino.com players who deposit up with deposit code QUAD20 on Monday, November 5th will receive a 20% Match Deposit Bonus up to a $100 Bonus. CanPlayCasino.com players who deposit up with deposit code QUAD30 on Tuesday, November 6th will receive a 30% Match Deposit Bonus up to a $100 Bonus. Any player who completes the deposit requirements of all three previous promotions (QUAD10, QUAD20 and QUAD30) will receive a 100% match deposit bonus of up to $100 Bonus on November 8th. Must use promo code QUAD100. The casino bonus and deposit carry a 30X play through requirement and expires in 15 days. Promotion dates vary between November 4th and 8th, 2018. Ends each day at 11:59 PM ET. 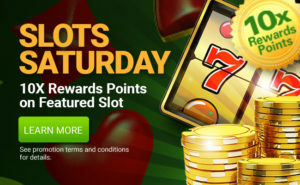 The four reload bonuses will be awarded automatically upon depositing with the deposit code.